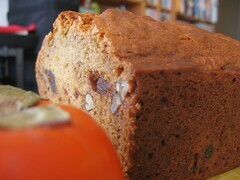 Persimmon Bread - Do You Know The Muffin Man? Notes: I soaked a bunch of hard, dried-out dates in bourbon overnight during which they softened nicely and absorbed all the alcoholic goodness. My Fuyu persimmons were so ripe they were almost liquid, so I used the smaller amount of sugar. A half recipe fit nicely into my 8.5" non-stick loaf pan but it required about 25 minutes of additional baking time as I had also reduced the oven temp by about 25°F. Bourbon gives the loaf a very buttery flavour. An interesting way to use persimmons.